Upholstery furniture can have a rich appearance that can add a luxurious feel to your home’s décor. However, upholstery when dirty, need a special cleaning technique that requires you to call your carpet cleaning technician to help. We understand how our customers feel about their upholsteries and it is the reason why we feel it is important to do pre-inspection and pre-qualification with our customers to avoid potential miscommunication. 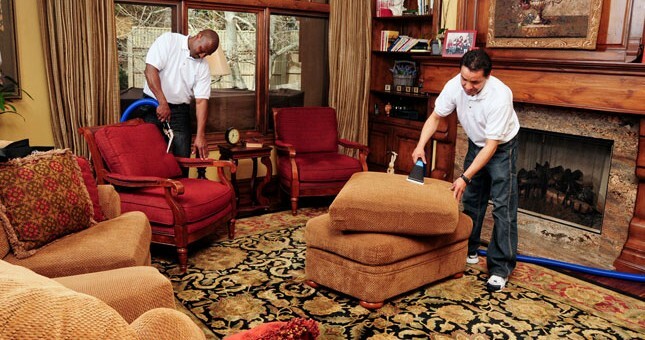 Hot water extraction cleaning has become the most popular method of cleaning upholstery. The process of injecting heated cleaning solution into the fabric and immediately vacuuming away the solution and excess soil make it an excellent cleaning method for most fabrics. How do we use the hot water extraction to clean the upholstery? 1. Vacuum: Brush and vacuum thoroughly. 3.Extract: We use our upholstery cleaning tool, clean the fabric with even, overlapping strokes. Scrub strokes may be used to improve cleaning on heavily soiled areas, but proper preconditioning should limit the need to do this. 5.We use carpet dryers to speed dry the fabric while we are cleaning up. Hot water extractor, Upholstery cleaning tool, horsehair brush, upholstery prespray, upholstery detergent and acid fabric rinse. Why do we use Hot Water Extraction? c. Equipment used for carpet cleaning will often suffice with the use of proper upholstery tools.